Phat Phak Bung* Fai Daeng (ผักบุ้งไฟแดง ) is one of a few Thai street foods that can be made at home very easily, quickly, and with great results. The ingredient list is short; so is the preparation time. Containing no meat and featuring only one main ingredient, the dish costs very little to make. You can’t say this about most of the famous items you find on the streets. 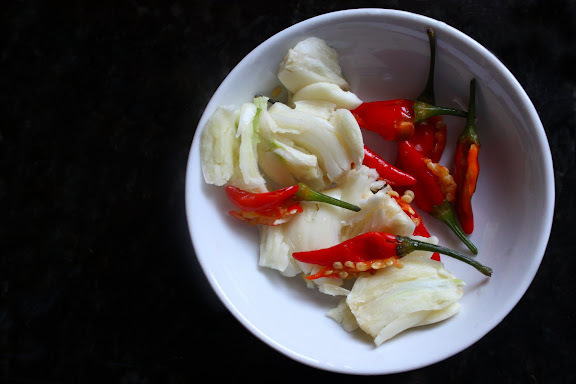 When friends who have never cooked Asian food their whole lives ask me to teach them an easy dish to make, I show them how to make Phak Bung Fai Daeng. It’s that easy. In fact, Phat Phak Bung Fai Daeng is so ordinary and so easy to make that brilliant marketing minds have figured out how to make it appear extraordinary and more complicated than it really is. How? They make the dish fly and give it a new moniker, “Flying Phak Bung” (ผักบุ้งลอยฟ้า). It’s quite entertaining, though; I’ve got to admit. But, oh, what a waste of food it can be sometimes. Kids, don’t try this at home. The Chinese influence of this spicy stir-fry is undeniable. And even though wok cooking is something the Thais have learned from the Chinese, we don’t always follow the Chinese stir-fry techniques. Most home-style vegetable stir-fries are made over moderate heat. In this case, however, the method of stir-frying over extremely high heat**) is closer to what you’d find in Chinese cooking. The seasoning ingredients are commonly use in Chinese cuisine. Even the main ingredient itself, Ipomoea aquatica, is called in Thai, Phak Bung Jin, which is literally “Chinese Phak Bung.” Most of the time, though, it’s labeled “Ong Choi” or “Ong Choy” (蕹菜) at your local Asian grocery store. 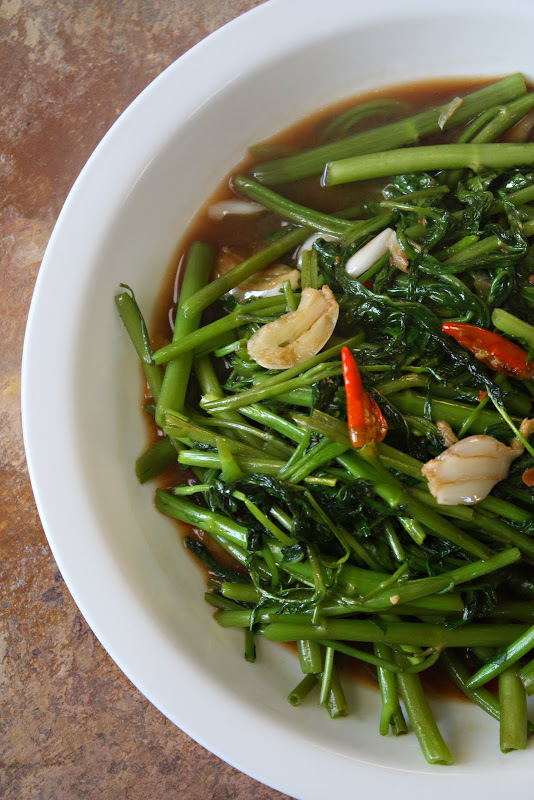 The generic Thai name of this vegetable is Phak Bung, but the designation “jin” (Thai for “China/Chinese”) is sometimes added to avoid confusion with Phak Bung Thai (Thai Water Morning Glory or Thai Water Convolvulus). This photograph shows Thai water morning glory in the middle and Chinese water morning glory right next to it (to the right). Notice that the (hollow) body of Thai Phak Bung is a bit larger than its Chinese cousin. The two are similar, but not entirely interchangeable. 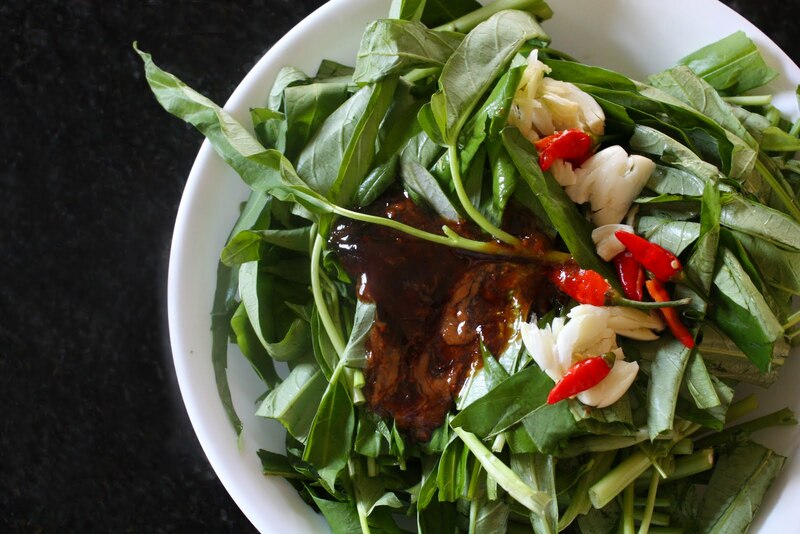 The kind used in this dish is the Chinese variety which also goes by Chinese morning glory, Chinese watercress, Chinese water morning glory, Chinese water spinach, etc. in addition to Ong Choy or Ong Choi, mentioned above. I’ll always regard Phat Phak Bung Fai Daeng with fondness, because its main ingredient, Phak Bung Jin is the first vegetable my hopelessly brown thumb and I have ever grown from seed successfully (5th grade), and it is the first farm (i.e. a small plot in my grandma’s back yard) -to-table dish I’ve ever made from scratch (also 5th grade). Don’t let the “aquatica” in Ipomoea aquatica or “water” in Chinese water spinach lead you into thinking that this vegetable is typically grown in water; it’s grown in soil. Garlic and chillies are smashed and left whole so as not to be too overpowering. Make sure you have a woklarge enough to give you room to move the vegetable around. Wash 1 1/2 pounds*** Chinese water morning glory, cut it into 3-inch long pieces, spun bone-dryor drain it very well, and place it in a large bowl. Set the wok over high heat***. Once the wok is hot, add 2 tablespoons of vegetable oil. Once the oil begins to smoke, dump the vegetable and the seasonings into the wok. Stir quickly to coat the vegetable with the oil and the sauce; it should take less than a minute for the vegetable to be tender-crisp and thoroughly coated with the sauce. Once that happens, transfer the stir-fry from the wok to serving plate immediately. Do not allow the stir-fry to stay in the wok beyond that point as the residual heat will continue to cook the vegetable beyond the tender-crisp stage thereby killing both the perfect texture and the beautiful, vibrant green color. You can toss the stir-fry across the room, if you want. I don’t recommend it. *Pronounced Pak Boong. I’m just not a fan of using “oo” to represent the u vowel—short or long. **The “Fai Daeng” (literally “red fire”) in Phak Bung Fai Daeng indicates the (red-hot) blazing flame over which the dish is cooked. ***This may look like a lot of vegetable, but it cooks down by a lot. What starts off almost spilling over your wok will end up barely filling your serving platter. THANK YOU!!! This was one of my favorite dishes while traveling through Thailand and you confirmed my Ong Choi guess when I tried to make it at home. postcard – As you can see, the dish travels rapidly through the air; it doesn’t merely stay suspended or move slowly in the air, cf. Superman flies; he doesn’t float (though he can). So I use “flying,” because it’s a more accurate description. The Thai moniker “ผักบุ้งลอยฟ้า” is a misnomer which becomes apparent only upon closer scrutiny. To render it literally would be convenient, but not very helpful. What a wonderful sounding dish. I’m going to have to seek out where I can source that green. You’ve shown me another recipe that I must try sooner than later. I have some serious catching up to do on your blog. I am behind but do not want to miss anything, but savor instead. I’ve never tasted Chinese water morning glory, but I know I’ll like this! Greens cooked with garlic and chiles are a great thing. Great to know it’s easy to grow too. Easy to grow vegetables are the only types I even attempt in my garden! Wow, those flames look quite amazing! I’m glad to hear you don’t need to throw it across the room to achieve a good flavour. Hello there! Stumbled upon your blog and really love what I saw! I like this recipe and it’s always my favourite! Wow! I’ve NEVER seen anything like this! What a treat to not only watch this chef and his assistant do their magic but to also enjoy the culinary result! Looks like what we call in Malaysia, kang kong. Can’t wait to try this when it becomes available again where I live in the USA. It’s so seasonal. I was told by a Thai friend that the secret ingredient that makes this dish delicious is a little bit of oyster sauce. Have you seen this before? Regional, or just personal? Anon – Thanks for bringing this up for I would not have noticed the accidental omission of oyster sauce in the recipe otherwise. Indeed, oyster sauce is a essential ingredient in this dish. One of the photographs shows oyster sauce and it’s also included in the video clip; I simply left it out of the instructions by mistake. Joel – Translate or transliterate? I think you meant the latter, but I just wanted to be sure. Well, technically I guess it would be both. The labels are in English script, but the names are – I assume – Vietnamese. Joel – I don’t know of any such resources. Sorry. Wiki is pretty good with listing out the names of a vegetable in different languages, though. Joel – But, really, ong choy or ong choi would be the most common name this vegetable goes by in the US. Hi, Do you have a source for buying seeds of the Chinese water morning glory? I’d love to have my kids grow and then cook this. That would be great. Thanks so much. Michelle – Sorry, I don’t. Does anyone have any info that would help Michelle?